Equalities campaigners hailed the move as a ‘momentous victory’. Scotland will be the first country in the world to ensure its education system recognises the issues faced by the LGBTI community, ministers have announced. Equalities campaigners hailed the move as a "monumental victory", claiming the "destructive legacy" of Section 28 - which banned the promotion of homosexuality - had been ended. Research by the Time for Inclusive Education (Tie) campaign group found 90% of LGBT people experienced homophobia, biphobia or transphobia at school. Co-founder Jordan Daly said: "After three years of campaigning, we are delighted that LGBTI inclusive education will now become a reality in all of Scotland's state schools. "This is a monumental victory for our campaign and a historic moment for our country." 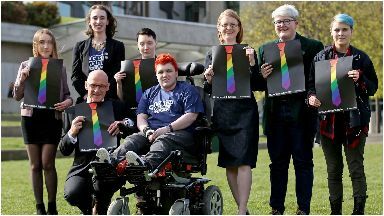 He added: "The implementation of LGBTI inclusive education across all state schools is a world first and, in a time of global uncertainty, this sends a strong and clear message to LGBTI young people that they are valued here in Scotland. "Eighteen years from the repeal of Section 28, we can finally put its destructive legacy to bed." He spoke after Education Secretary John Swinney announced the Scottish Government will accept all 33 recommendations made by the LGBTI inclusive education working group. This means all state schools will teach pupils of all ages about LGBTI equality, with the Government to fund training on this for teachers. Ministers will also ensure all schools have "appropriate" LGBTI teaching resources for lessons. Tie's research had previously revealed four of five teachers do not feel adequately trained to tackle homophobia, biphobia or transphobia. Mr Swinney said: "I am aware that some may say that LGBTI inclusive education could undermine the values of their faiths or beliefs. I do not take this view. "Human rights and the values of respect and tolerance are universal. Children and young people should feel happy, safe, respected and included in their learning environment, and all staff should be proactive in promoting positive relationships and behaviour in the playground, classroom, wider learning community and society." Mr Swinney said Scotland was "already considered one of the most progressive countries in Europe for LGBTI equality". He added: "I am delighted to announce we will be the first country in the world to have LGBTI inclusive education embedded within the curriculum. "Our education system must support everyone to reach their full potential. That is why it is vital the curriculum is as diverse as the young people who learn in our schools."